Rex is best known Australia wide for his remarkable bass voice - featuring recently in vocal groups such as Snap & Sh-Boom. Rex was a long time member of "Johnny Chester and Hot Spur" sharing in the success of a string of hits including, Rebecca, Worlds Greatest Mum and many more. The founder of popular band "The Dukes Of Earl" Rex is much in demand in the studio for his harmony ability. Chances are, when you hear a great bass voice on a CD or advertising jingle it's probably Rex ! few. 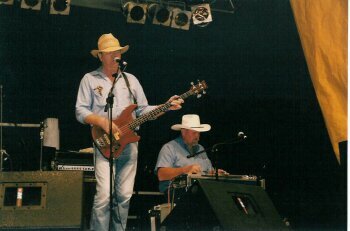 A founding member of the 80's award winning country band "Whiskey River" playing pedal steel and guitar Terry is looking forward to the same success with BigFoot. Dale was born and raised on the Darling Downs in Queensland where he started playing the piano at just 5 years old. He played his first professional gig as a guitar player at 12 in 1976. Today, many sounds and influences can be found in his playing which spans many genres making him an in-demand songwriter, studio musician, and valuable band musician for a number of different projects in the South-East Queensland area. Dale has recorded and played with many contemporary artists in Australia and has contributed to a number of high profile recording projects which include performance credits on two number 1's." 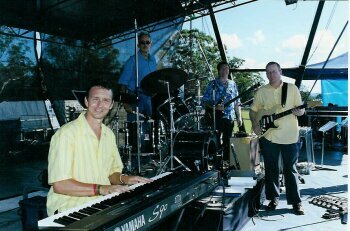 Chris has been playing piano/hammond/ keyboards in bands for over 20 years. He has toured with many artists including James Blundell, Adam Brand,Melinda Schneider,The Blue Heeler Band and international artists such as Johnny Tillotson and Dennis Knight. Chris has also worked with Phil Emmanual and recently recorded a DVD with Phil in Bendigo. Phil also used Chris on his soon to be released CD and recorded one of Chris's songs called "Thane". Chris has also written songs for Evelyn Bury including the title track of "The Fire Still Burns In Me" album. Playing with the likes of Phil Emmanual and James Blundell secured a contract with Yamaha Music of Australia where Chris is one of their demonstrators of hi tech gear. When Chris is not touring he works in his recording studio "Rock The House Productions" writing and recording jingles and other artists cd's.